Team Canada got off on the right foot at the FIBA Olympic Qualifying Tournament in the Philippines on Tuesday, defeating Turkey 77-69. 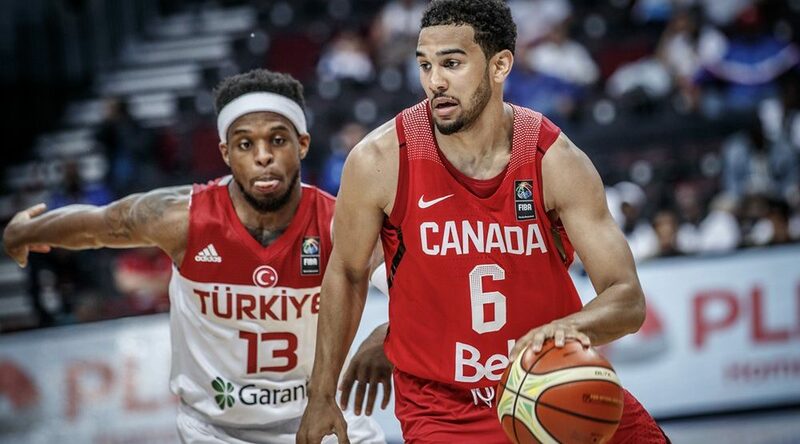 Toronto Raptors guard Cory Joseph led the way for the Canadians, dropping 21 points on 8 of 17 field goals. Joseph was joined by his former Raptors teammate Anthony Bennett in the starting lineup, along with Milwaukee Bucks guard Tyler Ennis, Basketball Bundesliga forward Thomas Scrubb, and Cleveland Cavaliers centre Tristan Thompson. Thompson scored 10 points for Canada in his national team debut, just weeks after winning an NBA championship. Turkey, short on NBA experience but not on talent, are the #8 ranked team in the world by FIBA. Canada, meanwhile, is much better than their #26 ranking would suggest. “Obviously they’re a very good basketball nation and it was a hard fought win,” Canadian head coach Jay Triano said of Turkey, who along with France, is one of the favourites in this tournament. Coming off the bench for Canada, guard Phil Scrubb scored 10 points for Canada, while Khem Birch led the way with 7 rebounds. Joseph had a team-high 5 assists. Sinan Guler was Turkey’s top scorer with 14 points. Canada shot 7 of 19 from the three point line and shot 83% on 24 free throws. Canada took the lead, 18-16, on a Brady Heslip three pointer with 28 seconds remaining in the first quarter. They never looked back. They led 39-30 at halftime, and started the third quarter on an 11-4 run. Joseph had 12 points in the third, helping to stretch Canada’s lead to 59-47. Canada cruised to victory in the fourth quarter, winning 77-69. “Bottom line is it was a win and it helps us with what our goal is, so we’ve got to turn around, play again tomorrow, and we have to keep getting better,” said Triano. Canada’s next game is against Senegal on Wednesday morning at 3:30 am PT (6:30 am ET). The top two teams in each group will advance to the semi-finals. A win against Senegal would guarantee Canada top spot in Group A. The winner of this tournament clinches a spot at the Rio 2016 Olympics next month.